American History is a fascinating subject. While it’s easy to complain about our government today, the very fact that it exists is remarkable. It’s worth looking into how it came to be during the American Revolution, and how it stayed together during the Civil War. Up and down the East Coast, there is a wealth of history and an abundance of historical sites. Intrepid history buffs have been known to spend years tracking down the birthplaces and graves of every signer of the Declaration of Independence. They have visited every state capitol battlefield after battlefield. Such people recognize that history is linked to place. We welcome history buffs to our historic Savannah Vacation Rentals. 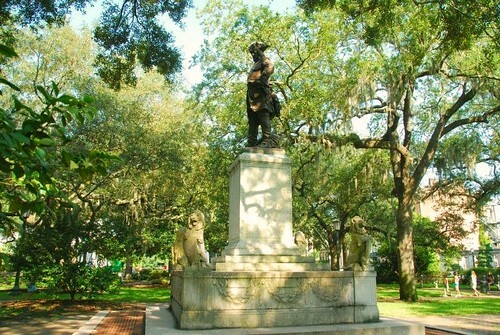 General James Oglethorpe presides over Chippewa Square in Savannah. Savannah was founded in 1733 by General James Oglegthorpe, a man who befriended the Yamacraw people, who then allowed Oglethorpe to build on a bluff overlooking the Savannah River. It was taken by the British fifty years later, and it remained occupied for four years. It survived fires, epidemics, and hurricanes, always rebuilding, always creating something beautiful. It was Savannah’s loveliness that spared it from ruin at the hands of General William Tecumseh Sherman during the Civil War. Instead of burning the city, as he had Atlanta, he offered it as a gift to President Lincoln. Guests of our Savannah Vacation Houses will find themselves surrounded by history, from the twenty two historic Squares right down to the rooms in which they sleep. Each year, the Savannah History Museum offers a lecture series on Revolutionary War Perspectives. The talks are free and open to the public, and they’re interesting to boot. The first of the series takes place at the Savannah History Museum on Tuesday, September 27, 2011, at 6:30 p.m. John Caramia will present “Deerskins, Trade Guns and Diplomacy in the Georgia Backcountry on the Eve of the Revolution”. Additional information on upcoming events may be found at the Savannah Coast Heritage Society. Please see Savannah Vacation Homes to check availability and make a reservation.